95B, the low now formed in the bay. Latest position is at 11.7n and 89.8E. The system is having clouding in its NE quadrant , at present. The low at present at 1004 mb, is likely to deepen and move initially in the West-Northwest direction. It will approach near the A.P. coast, resulting in rains along the A.P./T.N. coast around the 6th/7th. Oct.
Later, due to an approaching W.D. the system will be diverted to the Northerly track. And with the W.D. 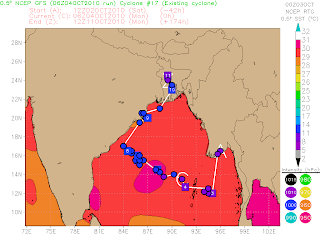 moving eastwards, the Bay system will start tugging in a northerly track, to cross the coast of Orissa, or maybe even W.Bengal by the 10th. Of all the possible feasibilities, I find the one in the enclosed map most likely and favourable. 96A is seen as hovering off the south Konkan coast. Like I mentioned for the previous low, observed today morning (Monday), I too do not read much in this low. It is a formation of convective heat, and will disappear by Tuesday. And the convective clouds are also seen off and along the Konkan coast. This is typical of a retreating Monsoon. The "aged" SWM is still precipitating rains below the 20N line. Heavy rains have been measured up in Ratnagiri, 87 mms, and Vengurla 71 mms, both in the Konkan. Goa received 41 mms.In the south Thiruvan. recorded 76 mms and Hasan 70 mms with Medikeri getting 62 mms. Another 2 days, and vagaries may withdraw the monsoon from Mah. r. Bhuj went up to 39c and Jodhpur was 38c. the day shot up to 44c.!! The port city of Karachi was at 39c today. 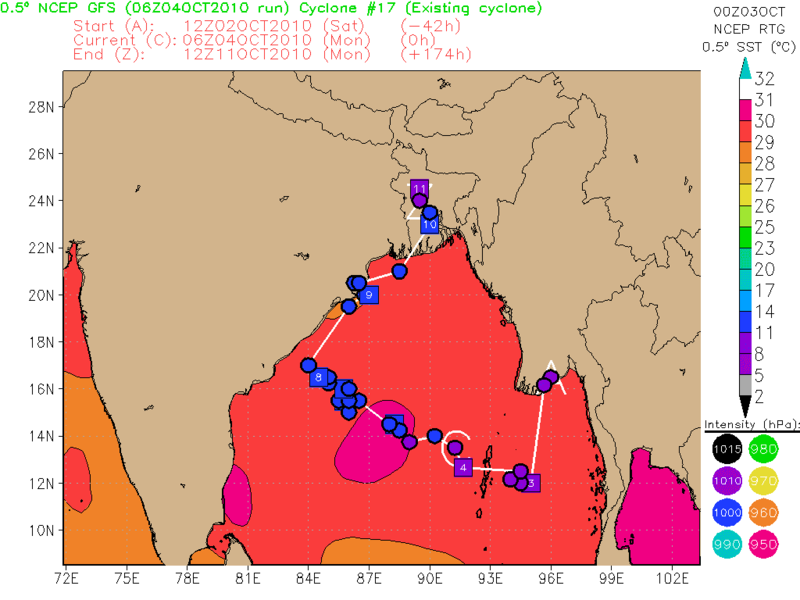 International models show the pressure in the Rajasthan region falling to 1002mb in the next 4/5 days. Now this is a bit surprising, for if it does drop to 1004 mb, when normally it should be at 1008/9 mb around this time, this forecasted pressure development may not be too favourable for the setting of th NEM. In this case, the monsoon trough would be prevented from "jumping downsouth." There was rains on and off (with one heavy and windy spell) at the Vile Parle - Andheri area yesterday night from 8:45 pm till about 10:30 pm. There was hardly any lighting or thunder just plain rains. And yes, for Vidharbha, it is north unexpected to expect thunder showers with severe lightning in these regions, around the time of monsoon withdrawal. Monsoon still on in region below 20N. 18died and 22 sustained burn injuries at Yavatmal,Akola,Washim,Buldhana,Bhandara and Amravati.